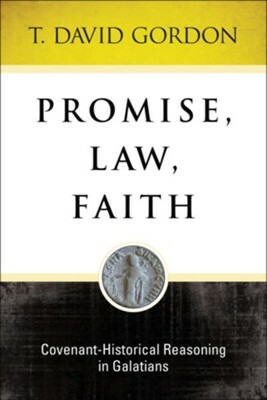 In Promise, Law, Faith, T. David Gordon argues that Paul uses "promise/ἐπαγγελία," "law/νόμος," and "faith/πίστις" in Galatians to denote three covenant-administrations by synecdoche (a figure of speech in which a part is made to represent the whole or vice versa), and that he chose each synecdoche because it characterized the distinctive (but not exclusive) feature of that covenant. For instance, Gordon argues, the Abrahamic covenant was characterized by three remarkable promises made to an aging couple (to have numerous descendants, who would inherit a large, arable land, and the "Seed" of whom would one day bless all the nations of the world); the Sinai covenant was characterized by the many laws given (both originally at Sinai and later in the remainder of the Mosaic corpus); and the New Covenant is characterized by faith in the dying and rising of Christ. As Gordon's subtitle suggests, he believes that both the "dominant Protestant approach" to Galatians and the New Perspectives on Paul approach fail to appreciate that Paul's reasoning in Galatians is covenant-historical (this is what Gordon calls perhaps a "Third Perspective on Paul"). In Galatians, Paul is not arguing that one covenant is good and the other bad; rather, he is arguing that the Sinai covenant was only a temporary covenant-administration between the promissory Abrahamic covenant and its ultimate fulfilment in the New Covenant in Jesus. For a specific time, the Sinai covenant isolated the Israelites from the nations to preserve the memory of the Abrahamic promises and to preserve the integrity of his "seed/Seed," through whom one day the same nations would one day be richly blessed. But once that Seed arrived in Jesus, providing the "grace of repentance" to the Gentiles, it was no longer necessary or proper to segregate them from the descendants of Abraham. Paul's argument in Galatians is therefore covenant-historical; he corrects misbehaviors (that is, requiring observance of the Mosaic Law) associated with the New Covenant by describing the relation of that New Covenant to the two covenants instituted before it--the Abrahamic and the Sinaitic-- hence the covenants of promise, law, and faith. Effectively, Paul argues that the New Covenant is a covenant in its own right that displaces the temporary, Christ-anticipating, Israel-threatening, and Gentile-excluding Sinai covenant. I'm the author/artist and I want to review Promise, Law, Faith: Covenant-Historical Reasoning in Galatians.